It cannot be denied that are lots of kitchen countertop options on the market. Hence, it is difficult for homeowners like you to find countertops Dallas that suit your kitchen. But hey, you have come to the right place. This article will feature only the best material for your kitchen. This list of options for kitchen countertops will help you make an educated decision once you decide to have your cooking area remodeled. Granite is the countertop material of choice when there are no other things to think about — like money. It defines elegance in a kitchen. 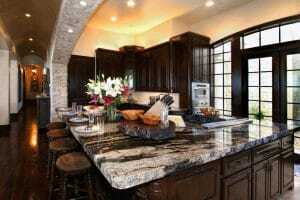 As the use of granite becomes more widespread, the price comes down. The beauty of this natural stone contributes to the beauty of even the most modest kitchen. There are a number of reasons why granite is among the best kitchen countertops options in Dallas. For starters, it holds up to heat and comes in a range of almost 3000 colors. It even looks permanent and substantial. More importantly, it will last a lifetime and new sealers are almost maintenance-free. This goes without saying that granite is the second highest hardness rating after diamonds. Quartz or engineered quartz is basically composed of 93% quartz particles. It is available in a larger range of colors than granite and has a nonporous surface that resists scratches, making it one of the go-to options for kitchen countertops in Dallas. It is easy to maintain, without the annual sealing required by natural stone. And mind you, quartz is highly resistant to stain and acid. They can even be cleaned and maintained easily. Because of its extremely high price tag, marble is not often seen as one of the best Dallas’ kitchen countertop options. To get the luxurious look, use it on an island or inset at a baking center. Marble requires constant maintenance, as it easily stains. Some new sealers retard staining. At the end of the day, marble gives your kitchen the appeal and elegance it deserves. You will love the fact that it is both waterproof and heat resistant. So, have you finally decided on one of the kitchen countertop options in Dallas? If you are still having a hard time, give us a call at Hard Rock Imports. One of our experts will help you understand the benefits and value of any of these countertop materials. Call us now!